Headed on vacation and need to pack the clubs? 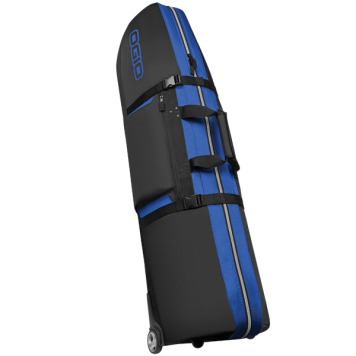 Keep them in line with the Straight Jacket Travel Bag from OGIO. This large golf bag can stow away all the clubs you need, plus balls, gloves, shoes, and apparel! The internal cinch-down straps will ensure everything stays in its place. And it can really handle a beating without backing down to the wear and tear of travel. The fully padded top protects your items from being jostled, and while you’re rolling through the airport on the smooth urethane wheels, you’ll truly appreciate the tip-resistant built-in stability. It might be big, but it easily fits into taxi trunks everywhere, and stands up to the stack when it’s on the bottom.